The concept of the Holocene epoch is a 19th century notion developed when the preceding “ice age” was thought of as a monolithic block of ice extending back to the end of the Pliocene. In this context it made sense to classify the current warmer condition as a new epoch. We have since learned that rather than being a solid block of ice the Pleistocene has been a period of wild swings between glacial periods and interglacial periods like our own, and that several prior interglacial periods have been warmer than our current interglacial so far. 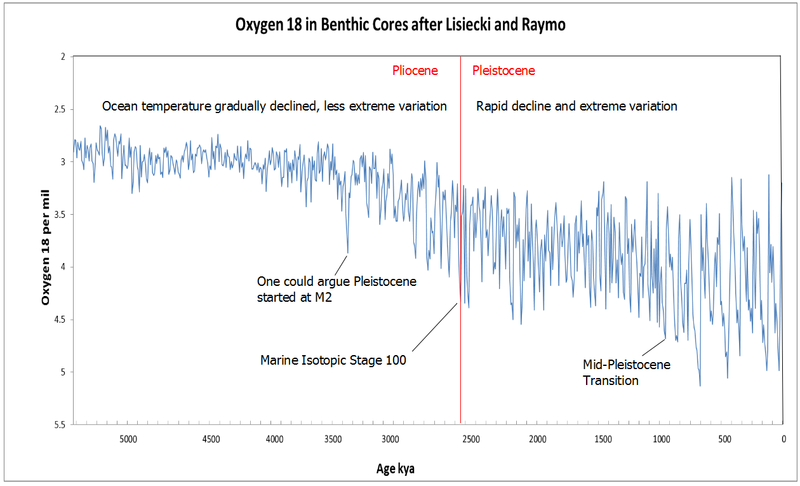 One can easily see from the graphic above that to classify our current interglacial as an epoch in a league with the Pliocene, which began near the left edge of the graphic as the warmer yet Miocene ended, is simply absurd. The absurdity is further exponentially compounded by the recent suggestion of an “Anthropocene”, presumably beginning in 1850. This notion is propounded by zealots who ascribe far more influence to human activity than any evidence supports. We therefore declare the “Misanthroposcene” and the “Hollowscene” null and void. Sorry y’all, but we are still very much in the Pleistocene. Tell you what, since our interglacial has not been properly named, we propose the Anthropic interglacial, and will refer to it thus henceforth. This entry was posted in Anthropic interglacial, Anthropocene, Climate, Geology, Holocene, Paleoclimate and tagged Anthropic interglacial, Hollowscene, Misanthroposcene. Bookmark the permalink.